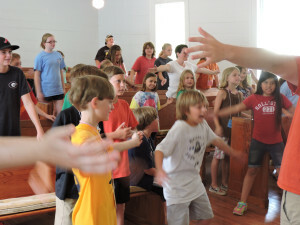 During each morning of the camp, counselors led the campers in interactive experiences of worship. 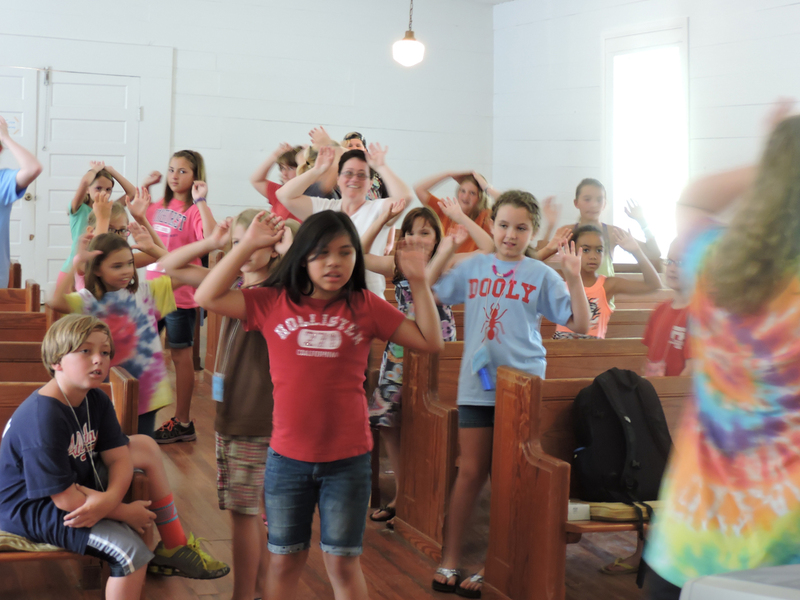 Moving toward a closer relationship with God and helping others gain a better understanding of Jesus Christ was the theme of this year’s children’s and youth camp at Dooly Campground June 18-21. Camp Director Rev. 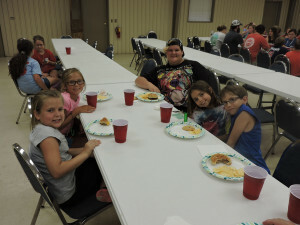 Josh Buzzell, pastor of the Byromville-Drayton charge said he and his 12 counselors emphasized the concepts of “fishing for people” as Jesus’ disciples did in the New Testament and moving deeper into the presence of God through the Biblical story of Nicodemus. Through worship experiences, devotional time, craft activities, recreation, games and lots of fun, the rising third through 8th graders were encouraged to ask questions about God, share their understanding of the Father in heaven and pray. Fourteen year old Tori Dukes of Americus said she enjoyed all the activities, especially swimming as well as the nice people at the camp. This was her first camping experience, but she definitely wants to return. Zeke Miller of Edison said this was his third trip to Camp Dooly, and the 11 year old also plans to come back a fourth time. “I learned you can’t hide from God,” he said. Making stepping stones as a craft and swimming were among his favorite activities. Emily Wright, 10, of Vienna said she learned more about Jesus and some “cool songs.” This was her second time at Camp Dooly. Rev. 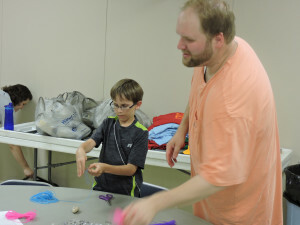 Josh Buzzell works with a camper during one of the camp activities. Three counselors, Mary, Julie and Hannah explained the importance of befriending the kids, giving them an opportunity to express themselves, letting them ask questions and keeping them entertained. The campers got points, the ladies said, for doing nice things during the four days at Camp Dooly, and at the end, the child with the most points received a trophy. Some 40 youngsters participated in the camp, Buzzell said. This was his first experience as director of the fast-paced camp which concluded with the opening service of Campmeeting, Sunday, June 21. 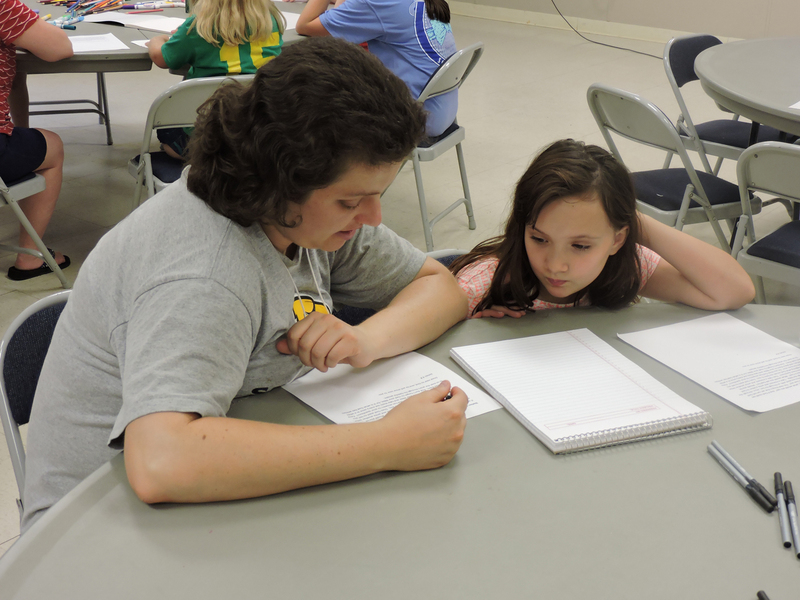 Cordele First UMC Children’s Director Kathy Minor assists Deardra McKinney with a writing activity during the children’s and youth camp. Among the staff at the camp were two long-time workers. 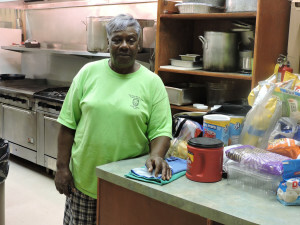 Nash Burton has been a part of the camps at Dooly for 31 years, and Lene Perry has been cooking for campers since 1976. Nash says he was baptized in the pool in 1992 when he was a camper, and he has been coming to camp ever since. He appreciates the many improvements he’s seen at the facility through the years, including a nice ball field, but regrets that there no longer are day camps, and youth no longer come to camp during Camp meeting and attend all the services under the tabernacle. Lene first worked in the camp kitchen when there was no air conditioning. She would spend two full weeks there, preparing breakfast, lunch and dinner, and sometimes there would be 100 kids at one camp. She is, of course, very glad to have a cooler working environment now. She also has better, more updated equipment. 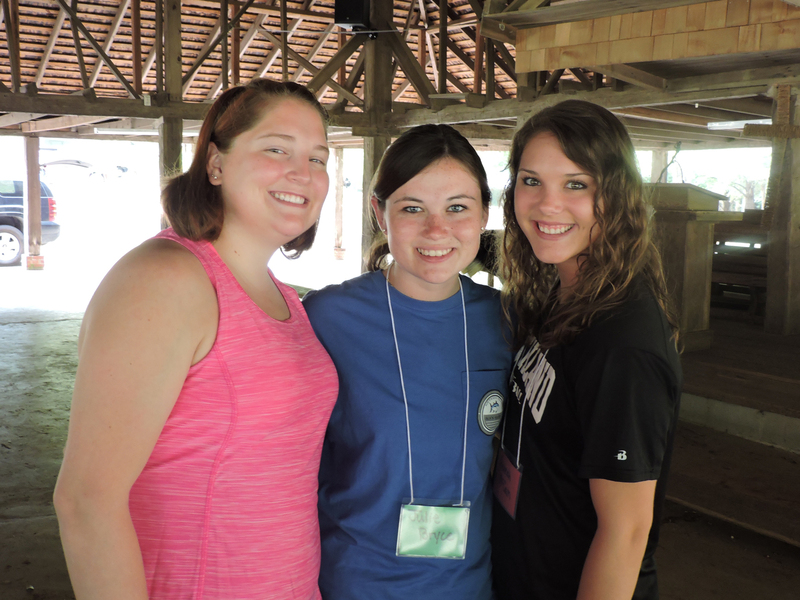 As camp counselors, Mary, Julie and Hannah gave their young charges opportunities to ask questions and participate in small group discussions. Campers (clockwise from front) Emily Wright, Carsyn Westmoreland, Tori Dukes, Sara Frost and Zeke Miller all said they enjoyed their camp experience and hoped to return next year. Lene Perry has seen considerable progress at Dooly Campground since she began cooking for campers 40 years ago. 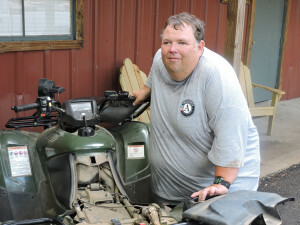 Nash Burton who has been coming to Camp Dooly 31 years, was baptized in the pool in 1992.